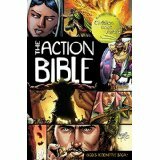 The Action Bible is a graphic novel that makes scripture come to life in an untraditional and exciting way. It uses several stories to convey the adventurous elements of the Bible that conventional translations may not communicate. Its strength is in the quality of the illustrations which are world-class. The stories are organized in the same order as the traditional canon but rather than saying “2 Samuel chapter 5”, each story is given its own title with the corresponding scripture in parentheses. It is a minor detail but one worth appreciating. The Action Bible is a great device to get otherwise uninterested readers’ attention but is not a threat to replace one’s study Bible or family Bible, which is okay! Using this text taught me about the multifaceted approach of the gospel; we all are not going to be sustained in the same manner, though we are quenched by the same fountain. I have used The Action Bible with students as young as third graders and have had great conversations with my middle school students as well. I would not recommend using it with students younger than 7. The imagery in some of the stories–Jezebel’s interactions with Elijah come to mind–are a bit graphic for the little ones and may even spook them. I hesitated to show my fourth graders the pictures during a scene where dogs were lapping up blood but they thought it was “Awesome!” They look forward to reading whenever we use it in class and it has served as a source of inspiration for the visual artists among my students. My greatest praise for this text is twofold: The inspiration that it gives my students who are fans of graphic novels, and the reminder it gives all of us that the characters in the biblical narrative are people. I would love to see my students get so caught up in the necessity of storytelling that they recast a biblical story in a contemporary context. Who are the Elijahs and Ahabs of today? How would YOU draw David and Goliath? I can imagine that the prospect of bringing scripture down to our level is an intimidating and anxiety inducing feat from some perspectives. I appreciate The Action Bible because it further proves the relevance and necessity of these stories. How important is interpretation in the delivering of a story? How can I use the biblical narrative to explain contemporary circumstances? What are the next exciting ways to deliver the biblical narrative? This review was prepared by Union Presbyterian Seminary – Charlotte student Christopher Burton. The Action Bible by Storypath is licensed under a Creative Commons Attribution-NonCommercial 4.0 International License.